Is there life on Mars? While recent evidence indicates ancient water may once have supported life on the red planet, our search for E.T. has come up dry. Of course, that hasn’t stopped folks from trolling through photos taken by NASA rovers and probes — spotting objects that look like faces, bones, and various critters. Psychologists say the human brain is hard-wired to look for patterns, meaning, and even faces in images — it’s a phenomenon called pareidolia. NASA’s Curiosity rover captured this cutie on Mars in January 2013. The rock does bear a remarkable likeness to an iguana — it’s got a tail, dewlap and even an “eye.” But again, this is just a rock. Curiosity captured this “finger” in 2012, and we can definitely see the resemblance to a human digit — it even has what looks like a fingernail. But it’s a rock. A rock, people! 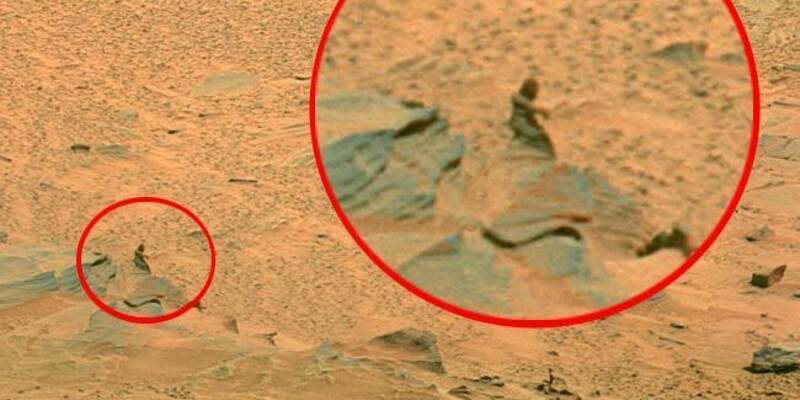 When the Mars rover Spirit captured this image of a human-like figure in 2007, alien enthusiasts hoped it might finally be a sign of alien life on the red planet. Scientists’ verdict? Rock. Last month, alien enthusiasts claimed to have found a “thigh bone” in an image taken on Mars . Again. We’re going with rock. Spooky! This skull-like object was spotted in an image taken by the rover Spirit in 2006. Similar “skulls” have been spotted in subsequent rover images — including a bird and a T. rex. Even an “alien’s skull” was spotted. The verdict? ALL ROCKS. When a rock shaped like a jelly doughnut mysteriously appeared in front of the Opportunity rover in January 2014, everyone wondered how it got there. Was it dropped there by an alien cop on his coffee break? Nope. According to NASA, the rover flicked it into its own path. Bloggers spotted this “helmet” or “bowler hat” in a 2013 Curiosity photo. It’s definitely a rock.